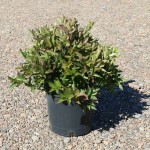 A compact small shrub with fragrant white flower spikes in the early summer. The fall foliage is a bright, deep red wine color, lasting well into fall. It does well in sun or shade and is tolerant of wet sites. Useful in mass planting, along a stream bank, or in the shrub border.